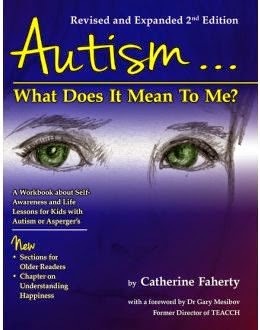 "Autism... what does it mean to me: A workbook about self-awareness and life lessons for Kids with Autism or Asperger's". Revised and expanded 2nd Edition, by Catherine Faherty. Autism, what does it mean to me is a hefty quarto-sized volume of nearly 500 pages but luckily, the print is rather large. It is designed as a workbook for children with autism and it seems to contain questions about pretty much everything that you or your developmental pediatrician could want to ask about your child. It's a stunning piece of work covering a vast array of topics ranging from innermost feelings, sensitivity and creativity through to friends, family, school and general emotional well-being. Each chapter is clearly marked and starts with an introduction to the topic before it segues into a plethora of questions. After the questions, there is specific advice for parents on the various responses and on the topic in general. New to the second edition are sections directed at older children, teens and adults which cover some crucial topics such as participating in the IEP, personal safety and depression. This isn't a book that you will simply read and leave on the shelf, it's a book that will become a type of journal that you and your child will want to carry and refer to for years to come. Some parts of the book will be more suitable for younger children while others are much more suitable for older ones. It's probable that over time, you'll want to revisit your child's answers to questions to determine if things have changed. This is most definitely a book that you should take with you when you visit the therapists or practitioners who are looking after your child. The questions in this book are cleverly posed to make it easier for your child to respond. While there is certainly space for long answers, the majority of the questions can be answered simply by highlighting the most appropriate multiple choice answers. This makes the book much more approachable to even the most writing adverse children. Throughout the book there are examples drawn from research, from real life and from autism advocates. In fact, I was stunned and impressed by the extent to which these advocates have been included. It's something that is sorely missing from most books of this type. Many of the illustrations are done by individuals on the autism spectrum and there are pull-out quotes from people on the spectrum of all ages scattered throughout. I wholeheartedly recommend this book to all families with children on the autism spectrum, particularly those with younger children (of about five years of age) who will be able to get the most out of the entire book. This is also a great book for practitioners in autism and special needs related fields as it contains many great mini questionnaires designed to find out how children on the spectrum really feel - and of course, it's full of useful information about how to respond. Autism, What does it Mean to Me? is available from Future Horizons Publishing. It is also available on Amazon but at the time of writing, they appear to only have the first edition. Honesty clause; I was provided with a copy of this book free of charge for review purposes. I remember seeing that book about 10 years ago and being really impressed with it. The mother of a child I worked with had gotten it for her son to help him understand autism. Great book!